I apologize to all of you who do not (yet!) own 6-inch round cake pans, but I’m having fun with mine and am enjoying scaling down larger recipes. We just haven’t had a lot of need for large cakes lately, but I still love making them. So given that, here’s a recipe for a Six Inch White Cake. 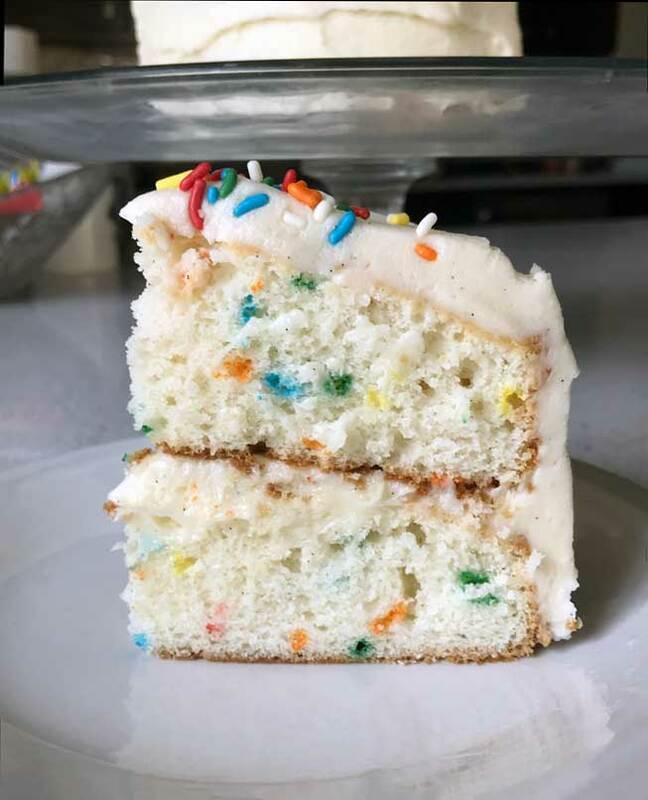 The recipe started as my Funfetti Cupcakes halved and baked in 6-inch pans rather than cupcake cups. Fuzz and I enjoyed it, but I wanted to try a second version so I made a new one with buttermilk. I usually associate buttermilk with chocolate or yellow cake rather than white cake, but in the end we both liked the buttermilk version better. 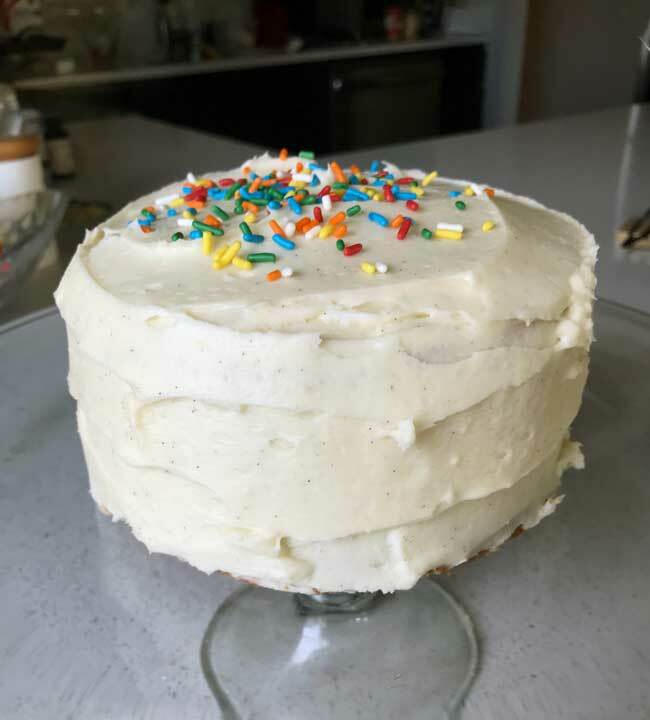 For the frosting, I was going to make a rich buttercream but at the last minute opted to go with Stella Parks’ recipe for Classic American Buttercream. Maybe next time I’ll do a Swiss or one of the others from her buttercream recipe collection on Serious Eats. I’ll update if I try any of the other frostings. Preheat oven to 350 degrees F. Grease and flour two 6-inch round cake pans. First, weigh your flour then sift it with the baking powder. Stir in the salt (it tends to get clogged in the sifter, so it’s best to just stir it in after. Set aside. With an electric mixer, beat the butter and sugar until light and fluffy, scraping sides of bowl often. Beat in the vanilla and almond extract. With the electric mixer, beat on medium high speed for 20 seconds or until batter is free of lumps and all flour is incorporated. In a clean bowl using clean beaters, beat the egg whites until stiff peaks start to form. Discard 1/3 cup (17 grams) of the beaten egg white and fold the remainder (about 82 grams) into the batter. Stir sprinkles into the cake batter (if using), then divide between the two pans. You should get somewhere around 10 oz/280 grams per pan. Bake at 350 for 28 to 30 minutes. Let cool on a baking rack for 10 minutes, then carefully turn from pans. Let cool completely. To make the frosting, beat the butter with an electric mixer until fluffy, then gradually beat in the confectioners’ sugar. Beat in the cream and vanilla, using more cream (or adding a little milk) to thin if needed. The original egg white measure was 5 egg whites, so rather than halve one raw egg white to make 2 ½ egg whites, it’s better to just whip 3 egg whites until stiff peaks form, then discard about 17 grams of whipped egg whites (1/3 cup) before folding into the batter. Sue, I remember back in elementary school someone brought those ice cream cone cupcakes to school and I thought it they were just the coolest things ever. I wonder why people don’t make them more often. This cake looks like fun. All funfetti type recipes make me think of cake baked in ice cream cones. I had that once as a child and it seemed so cool and fun to me at the time.